Do you still remember a scene when Patrick Star brought a rock named ‘Rocky’ to compete with Spongebob’s Gary and Squidward’s snail in a race? And eventually the winner of the race was Rocky! Do you still think that was logically impossible? Think again. 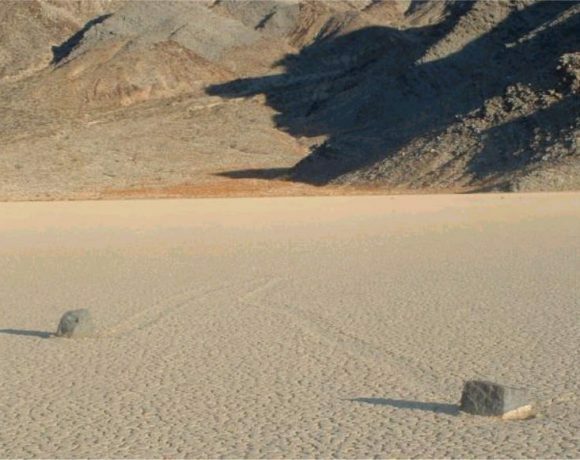 Located in a dry lakebed Racetrack Playa, Death Valley, California, a group of stones are ‘moving’ on their own when nobody is looking at them. The stones are ‘sailing’ from one place to another, leaving trails that are visible to our eyes but the movements are not. Herbert Genzmer and Ulrich Hellenbrad wrote about it in their book “Mysteries of the World: Unexplained Wonders and Mysterious Phenomena”. They stated, “The perfectly flat, dry ground is scoured and scraped with paths that suggest these boulders are being moved along the ground”. What brought them more surprises were, there seemed no outside forces that moves the stone. They wrote, “There is no indication of how this movement could have been brought about by outside forces, and no stone has ever been observed actually making its way across the ground”. 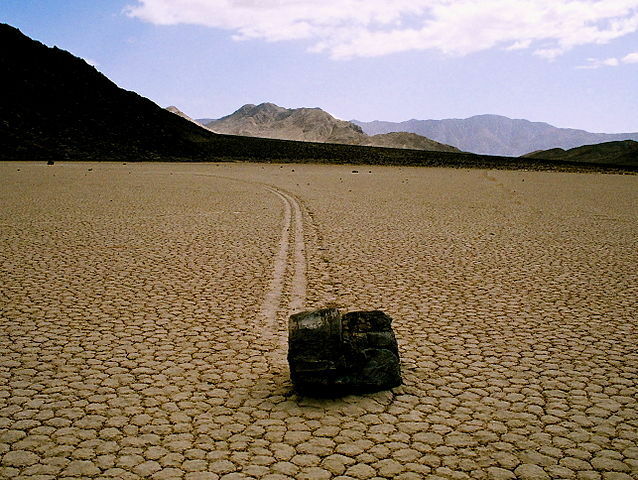 Yet, not every single stone in the Death Valley moves, some stays steadily still in their place. While some others move only once in several years. Indeed, not every stone there moves at the same time, and strangely not in the same direction. It leaves scientists confused, because if there is one force that is moving the stone in one spot of the place, the stone should be moving in the same direction. In addition, they should’ve moved in a same pace. Or at least, depending on their weight, it should’ve been measurable. But no, the stones are moving randomly, even some are showing 90 degrees turns from their original tracks. Some stones also show curved trails, unlike some others that show straight line that can reach up to 250 meters long. Conspiracy theories about the phenomenon spreads easily if there is a kind of strange phenomenon happening. Those theories are much more popular than scientific explanations. Even some people choose to be ignorant of any scientific explanation and keep the mystery rather be unsolved. Many theories have spread all around the world to describe the apparent movement of the stones, from aliens, magnetic fields, until pranksters. And yet, none of those theories could prove how so many stones could move from one place to another in such random movement. 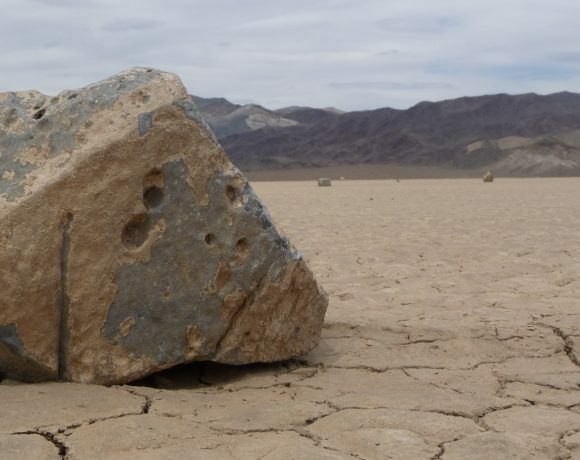 Scientists also took part to predict the cause of strange movement of the Death Valley stones. They found out that the moving stones are those in size of 15 to 45 centimeters. And because of those specific sizes, it meant that there were scientific causes. There are several theories that they proposed, such as unknown magnetic effect, and natural forces like wind and water. However, the magnetic theory has been ruled out after finding that most of the moving stones didn’t contain significant magnetic elements. But the other theory might explain it, this phenomenon occurs when wind and air work in particular way in the area to make the stones move. It happens the water makes the lakebed slippery and the wind makes the rock moves. This one theory rather makes sense because the lakebed is not always dry. In some occurrences, water from rain or snow will collect on the surface of the lakebed, and sometimes they collect when the temperature is below freezing. A thin layer of ice is developed, and this layer is the ‘carrier’ of the rock. “Solid ice, moving with the surface of the lake and with the inertia of a whole surrounding ice sheet, would have no trouble pushing a rock along the slick muddy floor,” said Brian Dunning, Californian researcher that studies this phenomenon. Ralph Lorenz from NASA tried to test whether the prediction involving ice and wind is the real reason. He did a little experiment with a small rock and a Tupperware container. “I took a small rock and put it in a piece of Tupperware, and filled it with water so there was an inch of water with a bit of the rock sticking out,” Lorenz told Smithsonian.com. He put the container in a freezer and some time later he found that the water has formed a thin layer of ice, and the rock was stuck in it. He then put the ice layer on top of a tray containing water and sand. 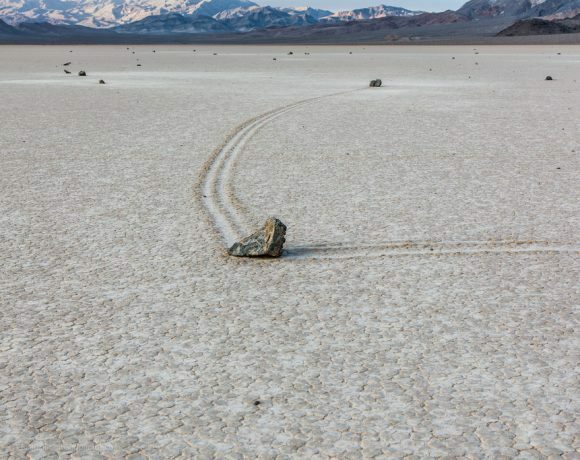 A little blow showed the same signs as what we can find in the Death Valley’s sailing stones, a trail and the moving stone. Another effort to prove the theory was also done by a team of scientists in 2013. 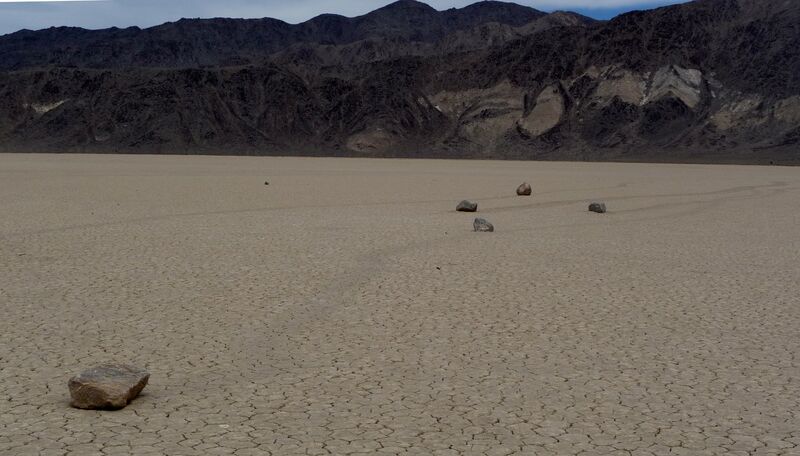 They attached motion-activated GPS to the stones in Death Valley and put some cameras to capture time lapse photography. The time lapse cameras substituted the presence of human to witness the movement of the stones. From the footage, it showed that a thin layer of ice was formed when the stone was moving. And it also found out that a gentle blow from the wind was the cause of the moving ice layer, which carried the stone. They then issued this finding in a journal in August 27 2013. However, although the video footage and experiment could prove how the stones move in such enigmatic way, some mysteries remain. Not only the small stones, but actually some gigantic boulders in the area also showed signs of movements. Yes, thin layer of ice may carry the stones in the size of 15 to 45 centimeters. But for explaining how bigger boulders move, there might be another different process needed. Maybe thicker layer of ice, or stronger wind, or maybe even another level of natural occurrences. Can it be pranksters, paranormal activates, or UFOs?